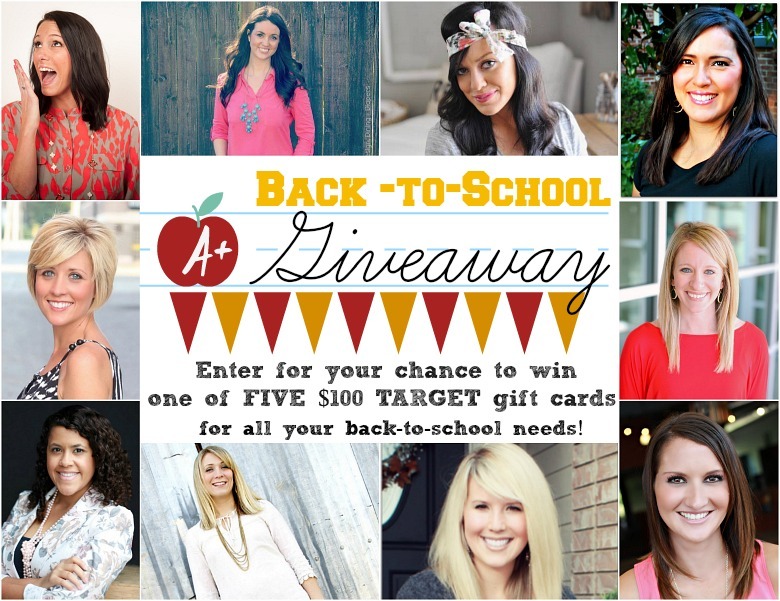 I Love You More Than Carrots: Head Back to School With One of FIVE $100 Gift Cards to Target! Head Back to School With One of FIVE $100 Gift Cards to Target! We all know how exciting Back to School shopping can be- the prospect of picking out new notebooks and matching folders, fresh boxes of crayons and colored pencils! Growing up, it was my second favorite time of year! Perhaps you're all set with your school supplies but are wanting to add a few fresh Back to School pieces to your Fall wardrobe! Regardless, who couldn't use $100 to Target? I know I could. It would at least cover that darn "cover charge" that gets me every time I walk in through those sliding doors! I'm teaming up with the same wonderful group of ladies (plus one more!) who brought you that amazing $1000 cash giveaway last year to give away five (!!!!!) $100 gift cards to Target. Be sure to visit their blogs listed above- you won't regret it and I promise you'll get lost for hours perusing their beautiful spaces and funny stories. No purchase necessary to enter. Be sure to read through the rules and regulations as listed in the Rafflecopter widget below! Good luck and thanks to all of those who enter! Win One Of My Favorite Baby Products! That Time I Cried Over A Scholastic Book Form. The Day I Saw Myself Through My Son's Eyes. Potties, Pinterest, OITNB and More.